Some 85% of the territory is covered by ice sheets. During a short summer the coastal area is bursting with polar poppies, moss and lichen. It is a stunning sight. An executive order on the formation of the “Russian Arctic” national park was signed last summer. Gennady Danilov, director of the federal natural reserve located on the territory of the archipelago, believes that the park ought to include Franz Joseph Land. It currently includes the northern part of the island Novaya Zemlya and several neighboring islands. In an interview with RIA Novosti correspondent Alexander Kuleshov Danilov argues for the creation of a single, specially protected natural park. He also explains what could attract tourists to the Arctic and details the potential environmental threats Franz Joseph Land faces. Question: Why do we need national parks in the Arctic? Answer: Today we do not have any agency with oversight of economic activities and security either on Franz Joseph Land or Novaya Zemlya. There is a frontier post on Franz Joseph Land: 18 people merely asserting Russia’s presence on the archipelago. They do not protect anything and there are no floating factories there. This territory is essentially open to foreign vessels. There is a weather station on the island of Heiss. The aim of creating the park is not only and not so much to preserve nature as to ensure national security. If territory is uninhabited it may be put under international control. This is why all countries assign the status of a national park to all uninhabited territories. This is what happens on Alaska, Greenland and the Canadian islands. Nobody can claim a territory with this status. Q: What will this national park be like? A: We believe this national park should include the territory of Franz Joseph Land and the northern part of Novaya Zemlya. But when this issue was discussed, some departments, including the Defense Ministry, insisted that only the north of Novaya Zemlya should be included into the national park, while Franz Joseph Land should retain its status of a federal wildlife reserve. Yet, in the future this will be an integral nature complex uniting the national park and the federal wildlife reserve. This complex will be under special protection. Q: Will research be conducted there? A: Of course, research has been and will be conducted on the territories of the park and the reserve. The Institute of the Arctic and the Antarctic is permanently involved in research there. The St. Petersburg Marine Geological Expedition worked there for several years. The Murmansk Marine Biological Institute conducted research there for four years. The Moscow Institute of Natural and Cultural Legacy at the Russian Academy of Sciences has operated there for over 20 years. The Norwegians are also engaged in research on these territories, and international expeditions have visited them as well. Q: Which territories have been studied more – Franz Joseph Land or the northern part of Novaya Zemlya? A: Novaya Zemlya has hardly been studied at all. Compared to Franz Joseph Land it is much less accessible and its flora and fauna has not been studied as much. Of course, when we organize tourist expeditions, we land there and walk by the shore. Last year, one Russian businessman completed the restoration of a winter hut in which the members of Willem Barentz’s expedition lived in 1596-1597. In theory, about 10 to 15 people can stay in such a hut for a time. Q: When Prime Minister Vladimir Putin signed an executive order to form the national park, he publicly urged ministry officials to spend their vacation in the Arctic. Is tourism possible there at all? A: It is possible and it exists. We bring about 400-900 tourists to the islands and the North Pole per year. The icy conditions allow tourists to come there during two or three months each year. 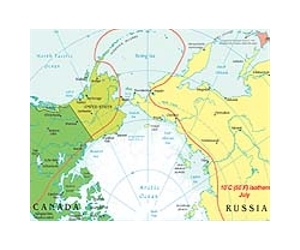 Ships can travel to Novaya Zemlya and Franz Joseph Land but tourism there is not easy to organize. Now we conduct tours from Murmansk to Franz Joseph Land on board nuclear-powered icebreakers. From there we visit the North Pole and then return to Novaya Zemlya. During these cruises we land in some of the most interesting natural, historical and cultural places. Eventually we return to Murmansk. It is possible to travel to Novaya Zemlya on regular passenger vessels kitted out with ice reinforcement. However, government officials from the ministries have not visited the Arctic. Q: Is it expensive to go there? A: The average price of a two-week Arctic tour is between $20,000 and $30,000. All amenities are provided. The ships have comfortable cabins, bars, swimming pools and saunas. It is possible to land from a helicopter on any spot. Q: What can tourists see there? A: First of all, polar bears, walruses and whales. Up to 3,000 polar bears gather on Franz Joseph Land, Novaya Zemlya and Spitsbergen in July-August. There are 1,200 walruses on the biggest haul-out site on the island of Victoria. There are also narwhales and rare Dutch whales that were all but extinct by the early 20th century. The environment there is very interesting, highly peculiar and beautiful. Some 85% of the territory is covered by ice sheets. During a short summer the coastal area is bursting with polar poppies, moss and lichen. It is a stunning sight. We also visit the historic locations where the first polar expeditions stayed. The descendants of members of the first expeditions come to pay their respects at the places discovered by their predecessors. Only the coastline can be visited in the Russian Arctic national park. The inland territory is mud-laden and impassable even for off-road vehicles. These are low lands with clay marshlands. Q: When will the Russian Arctic national park open? A document on its formation was signed last June, wasn’t it? A: No sooner than in 2011 when field support bases open for the park’s workers and tourists and when an oversight agency is appointed. The government executive order said that this agency should be established in the first quarter of 2010. Nothing has been done so far and we are drafting a letter to the government on this score. Moreover, the organization of the complex will raise the issue of recycling waste oils on the islands of Franz Joseph Land. Q: What is the estimated volume of waste oils there? A: There are about 60,000 tons in up to 250,000 metal barrels on three islands of Franz Joseph Land. They are leftover from the operation of military facilities. Everyone agrees this is “the number one contamination hotspot.” Today, a dozen countries are ready to pay to clean up these territories. Many Russian agencies would like to undertake this but if the territories are proclaimed a specially protected national park, all contracts will be awarded through tenders and supervised by the park’s administration. Q: What agencies are you referring to? A: The Defense Ministry would like to do this work and receive the funds for it. This is why the park’s opening is being delayed under all kinds of pretexts. Several conferences involving international environmental organizations have been held on recycling waste oils. A number of agreements were reached but the war in Georgia obstructed their implementation. Now international relations are returning to normal and I think we will soon resume these negotiations, all the more so since environmental issues in the Arctic will be particularly urgent during the development of the Stockman deposit.